רבי סימון בשם רבי יושוע בן לוי אותו כזית שאדם יוצא בו ידי חובתו בפסח צריך שלא יהא בו משקין רבי ירמיה אמר למצוה איתאמרת רבי אמר למצוה איתאמרת. We see from this discussion that Jews in Talmudic times (3rd-5th centuries CE) in the Land of Israel ate Matzah made with other liquids besides water, and the only time they had to eat Matzah made with water only was to fulfill the commandment of eating Matzah during the Passover Seder. In order to figure out which liquids were used in making Matzah we have to turn to a recipe made by the Kohanim (priests) in the Second Temple. Fired offerings and leftovers are given to the Kohanim (priests). 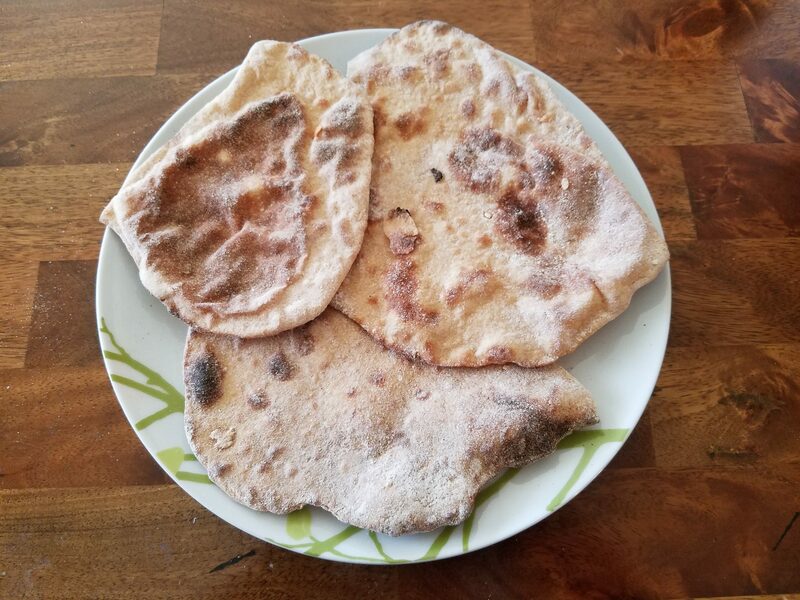 The priests are permitted to add in the leftovers of Menachot (flour offerings) wine, oil, and honey, and they are prohibited to let them become Chametz (leaven). האשים והשירים ניתנין לכהנים רשאין כהנים ליתן בשירי מנחות יין שמן ודבש ואסורין לחמץ. So we see that flour that was offered in the Second Temple, was actually mixed with wine, honey and oil by the priests after it was already sacrificed. Since it was not allowed to become leavened this was essentially Matzah made with honey, wine and oil. This recipe was inspired by the original Exodus Biblical Matzah recipe, the Land of Israel Biblical Matzah Recipe, and the Matzah of the Priests in the Second Temple. It is a mix of ancient Emmer and Einkorn wheats and uses wine and honey instead of water. Ancient Wheat Honey Wine Passover Matzah is made with ancient Einkorn and Emmer Wheat flours, wine and honey. It is Kosher for Passover according to strict rules of Kashrut, but cannot be used to fulfill the commandment to eat Matzah during the Passover Seder. Einkorn wheat was more prevalent in the Land of Israel than in Egypt, where the Emmer wheat was mostly used. This matzah recipe is more authentic to what the rich Israelites could have eaten once they have reached the Promised Land and had wine and honey at their disposal. Place 3/4 cup of Einkorn Wheat flour and 1 1/3 cups of Emmer Wheat flour into a large stainless steel bowl in which the dough will be kneaded. Slowly add 6 tablespoons of wine and 4 1/2 teaspoons of honey to the flour in the bowl. Quickly knead the dough with your hands by folding it over and over. The dough will form into a nice firm ball after 4-5 minutes of kneading. Note that the Einkorn flour is very hard to work with. It creates a very sticky dough that takes longer to form in the right consistency than other flours. This may require extra time to knead it and adding extra flour on to the kneading and rolling surfaces to prevent sticking. Sprinkle a large wooden cutting board, which will be your rolling surface, with some Emmer (not Einkorn) flour to prevent sticking. Take the ball of dough from the bowl, place it onto the rolling surface and roll it with your hands into an even cylinder slightly shorter than the width of the cutting board. Take a wooden French rolling pin, rub some Emmer (not Einkorn) flour onto it with your hand, and begin rolling out the dough ball into a flat pancake. Keep rolling the dough into different directions so that the pancake comes out to be round. The final thickness of the pancake should be about 2-3 mm (0.08 - 0.12 in). This step should take no longer than 1 minute. Repeat steps 9-11 with 2 more pieces of dough that you set aside, until you have 3 dough pancakes placed on to the pizza peel, which should make it full. The Matzah should be soft and fluffy, but have some crunch to it. It should taste sweet and very flavorful. Hey Buddy!, I found this information for you: "Ancient Wheat Honey Wine Passover Matzah". Here is the website link: http://www.ancientrecipes.org/recipes/ancient-wheat-wine-and-honey-passover-matzah/. Thank you.